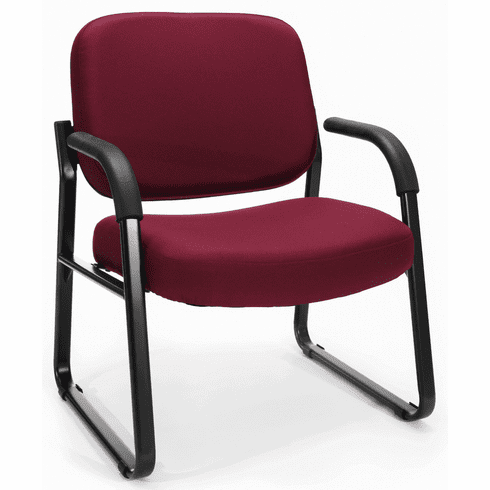 This big and tall sled base guest chair, from OFM, features a heavy duty tubular steel frame with a 23" wide seat. Other features on this sled base chair include a thick, foam molded seat and backrest cushion for lasting comfort, stain-resistant, commercial grade upholstery, stable sled base that glides over carpet for easy mobility and frame integrated armrests with urethane pads. This big and tall guest chair is rated for users up to 400 lbs. and meets or exceeds ANSI/BIFMA standards. Dimensions: Seat Size: 23"W x 21"D. Back Size: 23"W x 17.50"H. Seat Height: 18"H. Overall: 35"H x 27.5"W x 28.5"D. Weight: 46 lbs. Limited lifetime warranty from OFM. This chair normally ships within 1-2 business days.